Life-saving drugs, step-changes in energy efficiency, robots and amazing new materials that can transform our lives – these, and many scientific advances, are all the result of research and development (R&D). 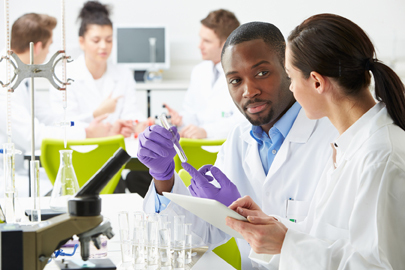 The UK funds £31.6 billion of R&D a year, and its success depends frequently on collaboration between a wide range of government departments, and with research councils, university bodies, businesses, charities and international organisations. As we look at the fascinating world of R&D, we can also learn much for all types of cross-government collaboration and coordination. R&D is essential to finding solutions to major problems, from climate change to anti-microbial resistance. It contributes to human knowledge that opens up new frontiers, and it drives improved productivity and prosperity, including through creating high quality jobs. This is why the government’s 2017 Industrial Strategy highlights the importance of R&D for UK economic growth, and why the government has committed to R&D to improve healthcare and medicines. It’s also why a number of different departments fund areas of R&D. 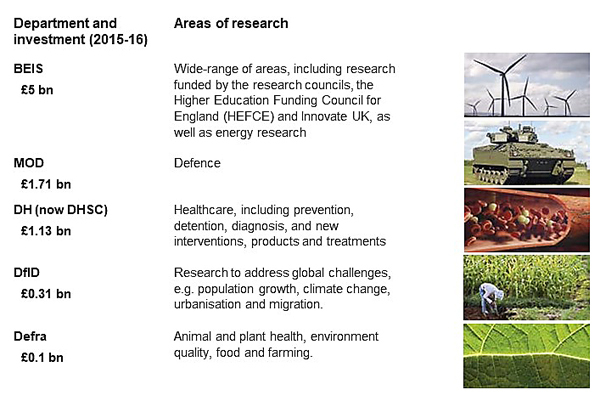 From April 2018 a new body, UK Research & Innovation (UKRI) will bring together the former research councils, and Innovate UK and Research England (currently part of HEFCE). The UK is a net receiver of competitive R&D funding. The UK’s exit from the EU could affect how UK research is funded in future. The UK government has promised an additional £7.0 billion R&D funding in the five years to 2021-22. This is on top of public sector R&D funding that totalled £8.75 billion in 2015. Our review focused on six areas of research that we assessed in terms of good practice and opportunities for improvement in their coordination of R&D funding. Interactive case studies of each of these six research fields are available on our report page. Our evaluation was based on a framework setting out questions around four principles of effective coordination and outlining what ‘good’ looks like. Our Research and Development Evaluative Framework (pdf – 209KB) is available on our website. Although written specifically for R&D, the principles in it are equally valid for all areas of cross-government coordination. Few people would disagree that the approach to a wide range of issues should be coordinated across government, from matters that clearly affect all parts of life such as the environment, to complex issues such as tackling the causes of crime and social ills. But it’s not easy to coordinate different agendas and priorities, gather information across different systems, or integrate processes into different areas of operation. 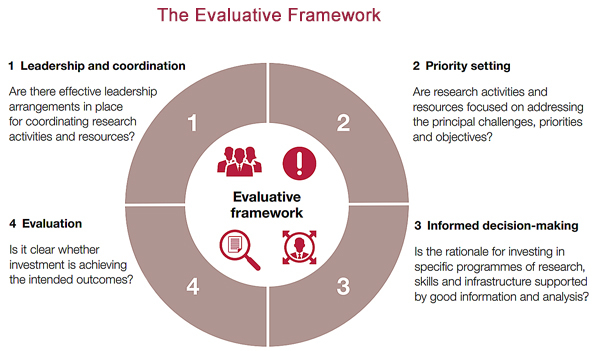 Our review of R&D funding processes and our Evaluative Framework doesn’t provide all the answers, but does provide a guide to what good will look like and offers questions to aid organisations’ self-evaluation. The principles, challenges and attributes of ‘good’ are relevant to all cross-government collaboration and coordination. The challenge: Cross-government projects often have no obvious single responsible body. Strong leadership and a culture of coordination and collaboration. Collective action is facilitated by various groups and forums that coordinate and align activities. Key players come together to identify opportunities, tackle barriers to collaboration, coordinate activities, discuss future needs and developments, understand available resources, and develop partnerships. This may involve setting strategic direction for a sector as a whole or for particular areas. The challenge: Multiple bodies typically means a wide breadth of activities, multiple priorities, a range of users or customers, and no over-arching strategy. A common understanding of the principal challenges. Clarity about the priorities, opportunities, objectives and direction. Roles and contributions of key players in addressing objectives are understood and agreed. Outputs of horizon-scanning influence decisions about future priorities. The challenge: Multiple organisations and sectors frequently means different data systems, technologies and standards, difficulties in gathering coherent information from multiple sources, and challenges in ensuring information is kept up-to-date. Data analysis has facilitated discussions on gaps and opportunities, improved coordination, and directed priorities and decisions. Decisions take account of the activities of others. For example investment decisions take account of where industry, charities and other nations are investing in programmes, skills and infrastructure. Information on proposed programmes, activities and outcomes is shared across organisations to avoid duplication of effort. Information and knowledge is used to coordinate and align priorities and submit joined-up business cases and bids, where appropriate. The challenge: Gathering evidence about the extent to which actions have driven outcomes is always challenging, even more so across multiple organisations and sectors. There is available data on activities. Work is undertaken to bring together and evaluate the benefits of activities and to make the case for future plans. There is a clear strategy for translating and exploiting the outcomes, e.g. in the case of research, for driving new innovations, products, services and wider public benefits. Further steps to good performance measurement can be found in our earlier blog-post, Measuring performance delivered through others. Many of our reports highlight the need for better cross-government coordination. The following reports, which can be found on our Cross-government and public administration web-pages, illustrate some of the many areas where government bodies needs to work together. Cross-government strategies and coordination will be increasingly important for the government to address the challenges of exiting the EU, on top of its many existing programmes and ongoing austerity measures. We hope that our new Evaluative Framework (pdf – 209KB), developed to support cross-government funding of R&D but potentially applicable to other areas of cross-government expenditure, will help organisations get the best out of opportunities to work as an effective HM Government. I would welcome your comments and invite you to contact us if you would like to discuss any of the issues raised in this blog-post. About the author: Sian Jones oversees the NAO’s value-for-money programme on Science, Skills and Industrial Strategy. 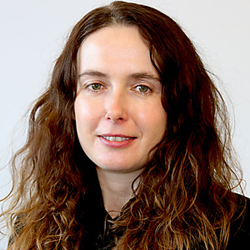 She joined the NAO in 2004, bringing a decade or so of experience in managing and delivering a wide range of research and evaluation projects in a variety of public sector settings. Before taking up her current portfolio, she worked in a number of different areas including environment, farming and rural affairs, local government and international bodies. Doesn’t this rather sidestep the question of WHO might initiative and oversee better coordination of R&D. Inside Whitehall shouldn’t we look to Govt Chief Science Adviser and the network of CSAs…but that highlights the relationship (now being negotiated?) between ‘Whitehall science’ and UKRI, which is of course being run by an influential former GCSA. Also you might have looked at the Life Sciences Strategy in which (lack of?) coordination between DH and DBEIS is apparent. We agree that who has overall responsibility for coordination of publicly-funded research and development is an important consideration and one that the Committee of Public Accounts asked government about at its recent evidence session on cross-government funding of R&D. We also agree that the Life Sciences strategy (published after we completed the majority of our fieldwork) is a key development and emphasises the importance of interdisciplinary research as well as government’s responsibilities in providing strategic direction for the sector. Great work! Perhaps there should be a government cloud (with a silver lining) for everything to do with procurement, research and productivity across all sectors! This is theoretical crap. The experienced talent just isn’t there. Gall’s Law…..learn it, contemplate it, apply it! No more big new NHS computer systems or brilliant ideas for NHS reforms not based on incremental increase to a small scale system which can be expanded incrementally to reach the objective. Look at Leeds City Council management system 1976-90. Now that the Government has committed itself to increasing investment in research & development in the autumn budget, the Private Sector should also be compelled to raise its R&D spend by a corresponding amount – in particular, the defence manufacturing industry. When it comes to Defence Contractors, they all say that they want to work in partnership with the Government, but don’t want to depend upon it. But the fact of the matter is that they are entirely dependent upon taxpayers’ money for their very existence – not least, because they are not investing any of their own money in R&D, innovation, creation of intellectual property or up-skilling employees. For some years now, Defence Contractors have repeatedly expressed their eagerness to invest Private Sector capital in MoD equipment acquisition programmes, provided the Ministry of Defence reveals more information about its spending plans. Yet, Defence Contractors’ behaviour is contrary to declarations of intent made in public because they have been found to be hoarding mountains of cash clandestinely and then sitting on it, instead of using it to fund in-house R&D to gain a competitive advantage, boost productivity and ready off-the-shelf products – by advancing the developmental status of their staring-points for the Technical Solution from its existing condition, to a point where it will satisfy the qualitative and quantitative requirements expressed in the invitation to tender, which will also serve to ease the burden on MoD’s equipment budget. This amounts to duplicitous behaviour – saying one thing and doing the exact opposite! The nub of the problem is that Contractors’ Business Model is founded on lies and deception; perpetrated by the few upon the unsuspecting many – Governments, Shareholders, Members of Parliament, employees, academics, the military, supply chain partners, journalists and the wider community – over several decades. Not a shred of honest intent is to be detected anywhere. An innovative proposal on how to go about eliciting Private Sector investment capital in defence procurement programmes is set out in a written submission to the Business, Energy and Industrial Strategy Committee, which reported on its inquiry into Industrial Strategy in the last Parliament. It introduces a modern Defence Industrial Strategy that puts financial security and the national interest first, not military equipment manufacturers’ commercial interests.